Board warpage in fiber-glass epoxy laminate boards known as “FR” boards, is familiar phenomenon seen in traditional electronics manufacturing. The growth of the LED general lighting market has propelled the usage of high-aspect ratio boards where the length is significantly greater than the width FR type boards for a variety of applications. A significant percentage of these boards are adopted for linear lighting applications where warpage of the PCBs is most commonly seen. Warpage, also known as bow is defined as the deviation from flatness of a board characterized by a roughly cylindrical or spherical curvature.1 Board warpage leads to stress and defects in the material stack such as weakening/cracking of solder joints, cracking of solder mask, component misalignment and in some cases, such warpage inhibits subsequent processing stages of the assembly. 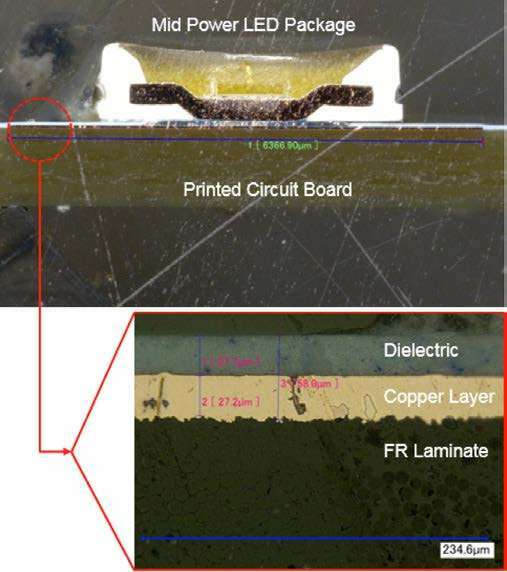 This paper presents a structured study to characterize the effect of warpage “bow” driven by different assembly process conditions on FR circuit boards with two dissimilar glass-transition properties designed as high aspect ratio linear lighting strips. Linear “tube” lights are one of the most adopted design forms for illumination. Historically, these tube lights have used florescent technology. The applications for linear lighting range across numerous applications from retail, industrial, commercial, and residential lighting. Today, with the realized benefits of Light Emitting Diodes (LEDs), these designs are being converted to this solid state technology. (I) Materials Stack: Aside from the difference in light sources, the overall material stack varies. Figure 1 depicts a typical completed stack of a linear light strip with a mid-power LED on an FR based printed circuit board (PCB). Despite many types of PCBs in use, from thick Metal Core PCBs, to thin polymer based flexible substrates, the most widely adopted PCBs for linear lighting is FR. An FR based board provides many advantages for the LED lighting industry, primarily, ease of sourcing, flame-resistance, retention of high mechanical and electrical insulation and lastly, and a diverse choice of fabrication designs and material cost advantages. (II) The Process: One of the major differences between fluorescent and LED technology is how the assembly process takes place. LED based lighting systems require a heavier usage of SMT / Wave soldering processes. In the case of linear light systems the construction uses a panelized design to process multiple strips simultaneously. It is ultimately this very process of thermal excursion combined with the material selection that causes warping/bow. Optimization of assembly process conditions, (II) Mechanically adhering PCBs i.e. with fasteners and or clips and lastly, (III) Modification of material selection and/or design. For this evaluation, the motivation to evaluate the effects of item (I): the assembly process and its effect on warpage is crucial as this is conventionally, the first article that is examined in the occurrence of warpage. Table 1 summarizes our approach to characterize different types of FR properties under variable process conditions of a soak and straight ramp profiles. The test vehicles used for this evaluation are designed in-house at Alpha. The design considerations are based on general market observations. Furthermore, the boards are functional which allows for operational testing. Table 2 summarizes dimensions and general attributes of the test vehicle. For this study a mid-power package was selected due to its common utlization in indoor linear lighting applications. It consists of a 3535 lead-frame design (3.5mm x 3.5mm). A small notch on the corner of the package marks the cathode side of the emitter package. The anode and cathode both serve as thermal pads for the emitter, with the majority of the heat being conducted through the larger pad, corresponding to the cathode as seen in Figure 2. The processing temperature conditions and its effect on different Tg laminates are largely dictated by alloy selection. A standard SAC305 alloy with a melting point range of 217-221°C and a novel low-temperature Sn-Bi based alloy (SBX02) with a melting point of 138.5°C are used. Table 3 summarizes the SMT equipment used for assembling mid-power LED packages on the test vehciles. A reflow oven with seven heating and two cooling zones was used for the reflow assembly. All boards were assembled in an air atmosphere with the following Temperature/Humidity conditions: 20.4-25.2°C / 16-47% RH. Table 4 summarizes both reflow profiles under low and high temperature conditions. ■ Figure 3. IPC 650TM 2.4.22 Measurement Technique. ■ Figure 4. 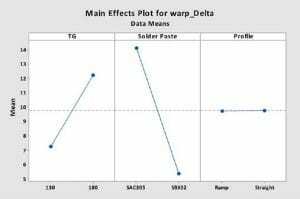 Main Effects Plot-Effect of Variables on Warpage. A variety of test methods and procedures exist to measure the deviation from flatness. This evaluation uses the IPC 650TM 2.4.22 methodology, Figure 3 describes the procedure of measuring the subject. The linear lighting test vehicles are laid on a flat surface with all four corners making contact, using a filler gauge, the highest point from the surface is measured which is approximately at the center. The same procedure is repeated for each board that has undergone reflow. The values are recorded as a difference between pre-assembly and post reflow assembly. ■ Figure 5. 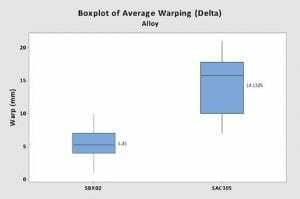 Warpage versus Processing Temperature as a Function of Alloy Selection. this particular assembly. Lastly, the laminate system with glass transition temperature (Tg) of 130°C generated lower levels of warpage. Overall, with the exclusion of the Tg property, the use of low temperature SBX02 alloy produces a 38% reduction in warp as seen in Figure 5. It is evident that low temperature processing using SBX02 alloy produces lower levels of warpage when compared to standard SAC assembly. Now, the effect of processing temperatures with laminates of different Tg properties are investigated in Figure 6. Interestingly, we observe that linear boards built with laminates using the 130°C Tg property produces lower levels of warpage when compared to 180°C Tg. We hypothesize that the influence of CTE interaction plays a more significant role. The combination of low temperature SBX02 alloy and 130C Tg produces the lowest level of warpage. misalignment. In some cases, it can inhibit subsequent processing stages of the assembly. It is clear that using lower processing temperatures can reduce warpage by 38% as shown in this evaluation. This is ultimately driven by the selection of low versus high melting point alloys. End-use environment and application needs to be carefully considered when attempting to covert to different alloys. In the case of indoor linear lighting using mid power LEDs on FR boards: it is feasible to use Sn-Bi based alloys such as SBX02 alloy.